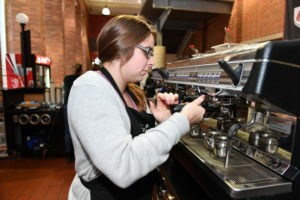 Atrium Cafe employees use new espresso machines to prepare customers' orders Friday, Nov. 9, 2018 in the in the Todd Hall atrium in Pullman, Wash. 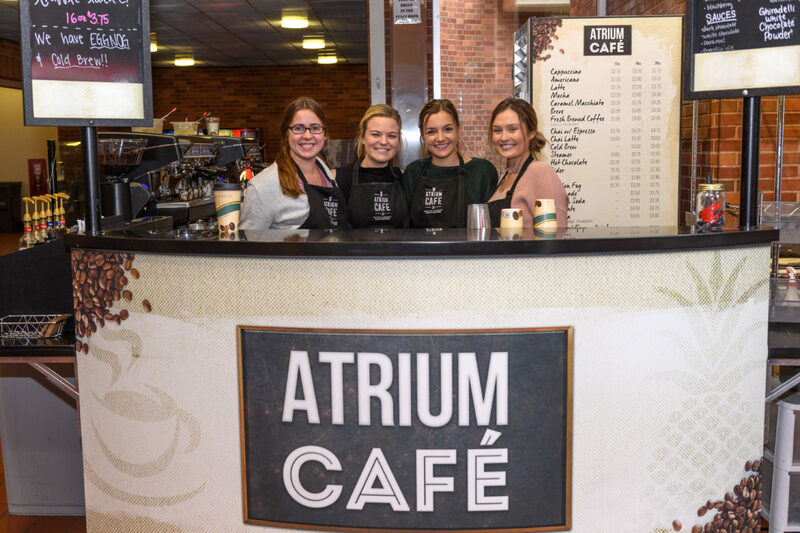 The Atrium Cafe is staffed by students enrolled in Carson College of Business School of Hospitality Business Management courses. Visitors entering Todd Hall may notice a delicious smell wafting throughout the building. The source stems from a hidden jewel on the Carson College of Business’s first floor, the Atrium Café. Staffed by hospitality business management students in training, the café offers a variety of baked goods made by Hospitality Catering Services and a host of beverages with enticing aromas that make it hard to pass by without buying something. Recently, sales have increased thanks to increased efficiency resulting from two new espresso machines donated by Farmers Brothers, a national coffee roaster with distribution based locally in Spokane and Union Gap. Weiler and his Farmers Brothers support team Brian Granely, Scott Lockhead and Patrick Sestak developed a plan to donate and maintain two new espresso machines and grinders, as well as supply two new pump pots and Farmers Brothers branding materials to enhance the café’s customer service and appeal. Jim Harbour, the hospitality clinical associate professor overseeing the café’s operations, gratefully accepted. The new equipment allows students to practice traditional methods of coffee production versus using the pod technology previously in place, he said. Bree Ask prepares an espresso with a new machine donated by Farmers Brothers. Having worked in the hospitality and food service sectors his entire career, Weiler reflects on the value that working in the Atrium Café provides hospitality students as future industry professionals. Espressos made with the new equipment are paying off in reputation as well as in sales, Ask said. To Weiler, it doesn’t matter if you are an operator, a vendor, an employee or a customer — everyone benefits by supporting the success of the next generation of hospitality professionals. To learn more about supporting the Atrium Café or the hospitality business management program, contact Jeff Pilcher, director of development, 509‑335‑8906, jeff.pilcher@wsu.edu.